At the Baltic shipbuilding factory Yantar, in Kaliningrad, a third frigate (project 11356) for the Indian Navy is being made ready to launch. The ship is called the Trikand. According to Yantar press secretary Sergei Mikhailov, the Trikand is more than 60% ready, already equipped with all the necessary mechanisms and a significant part of its weapons, including a Bramos missile complex. The remaining work to be done will be completed with the Trikand in the water. “Everything is going according to plan, the collective involved in this venture is trying to finish on schedule and, undoubtedly, to provide high-quality work,” said Mikhailov. The launch ceremony took place on May 25 with high-ranking civilian and military officials from Russia and India in attendance. Meanwhile Yantar is continuing work on two other ships from the “Indian series” — frigates from project 11356. The Teg is being prepared for its first sea trials, the Tarkash for its first mooring trials. The names of all three ships were given them by Indian President Pratibha Patil. The contract is worth $1.6 billion. 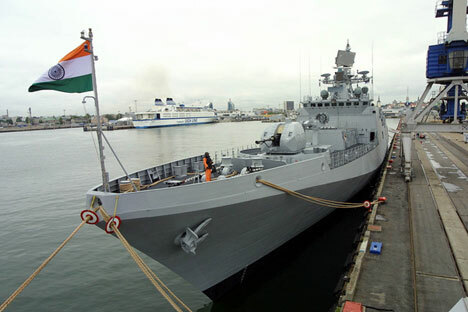 The frigates are scheduled to be transferred to the Indian Navy in 2011-2012.